An overhang above the Kitchener River and Aspiring Flats, near the Matukituki East Branch. Room to sleep 10, although exposed to weather, with dry space for 2 to 4. Another rock just below has space for 3 to 4. The biv features a dry stone fireplace. 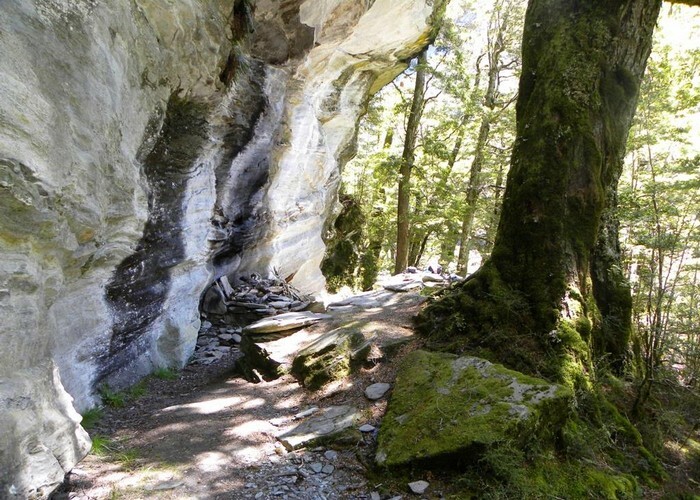 This rock overhang was discovered in 1958 by a group attempting Mount Avalanche. Rock of Ages bivvy - Mt.Aspiring Flats • By aardvark. Licence: C.
A cairn on the true right of the Kitchener River marks the route to the biv, 200m west of Rainbow Stream. A smaller biv is passed first. Added 10 July 2014 by MatthewMatthew. 2 revisions, most recently 23 July 2014 by MatthewMatthew. 390 views in the past year (33 per month).